"Resourceful. Thrifty. Creative. Hardworking. Patient." Just a few words Osage’s Sally Pennington used to describe her mother's dedication to the art of sewing and quilting. 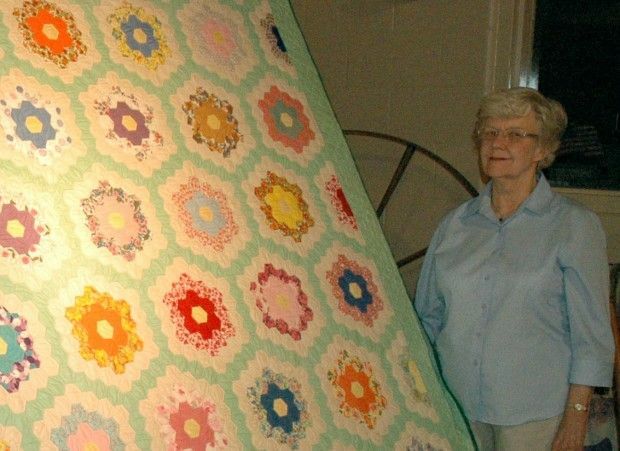 Pennington has two quilts currently on display at the Mitchell County Historical Museum located at the Cedar River Complex, one of which was quilted by her mother and one by her husband's great-aunt. Her mother's quilt, "Grandmother's Flower Garden," incorporates material from Pennington and her sisters, Willa Mae, Janie and Margaret Ellen, from dresses they wore during the 1960s. Pennington’s mother, Margarette, was a lady of Dutch descent who lived her life in and around Pella, Iowa. She and her husband, Walter, farmed and raised their four daughters. "My mother taught us so many home-making skills of baking, washing, cooking, canning, cleaning, and most of all sewing," said Pennington. "In our home, it was considered wasteful to throw away anything useful, so we learned to recycle before the concept was popular." In addition to quilting, her mother braided or plaited strips of worn woolen clothing into rugs. Her mother also did a variety of handiwork, knitting many afghans or crocheting doilies. "Unlike today's quilts, the pieces of this quilt were all cut with scissors and then stitched together with needle and thread," said Pennington. "Each evening she cut and stitched hexagon shapes into a honey comb block while listening to the radio or television." All the blocks have yellow centers and were stitched together with green to represent the grass. The quilting was also done by hand by a group of ladies in her hometown. It is called a "scrap quilt" since it was made from left-over pieces of fabric. "Margarette sewed most of the dresses for her daughters and then taught them to sew their own as they got older," she said. The pieces could be cut and pieced into any number of quilts and were an efficient, inexpensive and very colorful source of material. "She made five quilts of this pattern and then others as well, all from scraps," said Pennington. "For family members, the quilts hold many memories of cotton fabrics in familiar patterns of a dress or skirt we wore." Pennington's second quilt, "Postage Stamp," was made by her husband Bob Pennington's great-aunt before 1900. The fabric details are unclear but it is assumed it was designed to make use of tiny scraps of fabric. The "stamps" are sewn into a random design and simply sewed right beside each other. In other postage designs, such small pieces are sewn into a pattern of some kind or into a nine-patch and then separated with strips of fabric. "The quilt has a flannel back and is wonderfully soft and warm on a cold night," said Pennington. "Notice the vintage fabrics in the quilt and also that the quilt is tied with yarn. "It is all a very practical addition to a household after hours of tedious work by the woman who made it. Much love is stitched into a hand-pieced quilt."